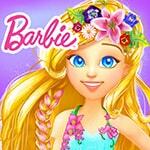 Go on an unforgettable adventure in Dreamtopia with Barbie. You are waiting for 4 different places at once, each of which is unique in its own way. Find the same cards, ride on the rainbow, look for differences in the pictures.